On request the library organises hands on workshops for UU research groups and graduate schools. Interested? Get into contact. Why should I care about my online presence? Whether you like it or not, Google Scholar is by far the most widely used bibliographical tool for scholarly publications. It has a problem however, and that is metadata control. You can enhance your findability by creating an account and telling Google which publications in their database are yours. After taking these steps searches on your name will show your profile on top of the results. 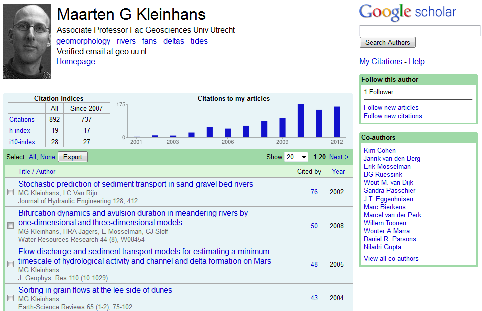 The profile itself shows your list of publications in Google Scholar with basic metrics. Besides journal papers, it may also include books and reports. If you do not yet have a Google account, go to Google and create it. Go to Google Scholar, make sure you are logged in and click "My Citations"
NB Because new articles are automatically added to authors' profiles it is wise to check regularly, because in rare cases articles may be wrongly attributed to you. ORCID (Open Researcher and Contributor ID) is a non-proprietary, international ID that provides you with a persistent digital identifier that distinguishes you from every other researcher. It is strategically important because it enables all databases to automatically link publications to you by your ORCID. At ORCID you can create a profile, link it to your Scopus ID, ResearchID and/or import publications from a so-called crossref search. Further functionality is being developed. ResearcherID is the profile tool from Thomson Reuters, the owners of Web of Science and the Journal Citation Reports. Researcher ID offers a public profile. You can choose what to show publicly. Researcher ID is also important as a basis to provide feedback to Web of Science for grouping author name variants or corrections to affiliations. Go to Researcher ID, sign up and complete your profile. Add some publications if you have a few listed in Web of Science and preview the public version of your profile. If you already have made an ORCID ID you can link Researcher ID to that. It is best to do that in a place where you have access to Web of Science. The Scopus Author ID is not a researcher profile site, but helps author recognition and disambiguation when searching publications. Many researchers already have a Scopus ID without realising it. By checking the correctness of publications assigned to your Scopus Author ID, you will certainly help others finding your stuff. It will also improve completeness and correctness of citation analyses. And it also improves feeds of your publications list to be shown on other sites. Check if all publications assigned to you are correct and if there are no variants of your name that are not yet grouped to your main entry. If there are ungrouped name variants with your publications send Scopus feedback by checking name variants and clicking "request to merge authors" on top of the results list. (For that it may be required to create a personal account within the institutional license). Did you know there is a free Scopus author preview? ResearchGate is a very large (originally German) researcher community linking researchers around topics. It is frequently used to ask questions to collegues all over the world that have the same set of interests and specialisations. You can choose which topics or researchers to follow. You can automatically populate your publications list or add items from reference management tools or add manually. You can even upload and share full text publications (e.g. last author versions that many publishers allow you to share). Go to Researchgate, sign up and complete your profile with whatever you think relevant. Add your publications by clicking add publications" and choosing "author match". Researchgate also boosts metrics for individuals and institutions: RG-score (total activity and weighed interaction, plus publications) and impact points (number of publications weighed by journals they are published in). Academia.edu is a large researcher community. Just as ResearchGate it connects scholars around topics. You can add papers through a built in search using Microsoft Academic, PubMed and ArXiv. You can also add ful text. The process is easy, but the coverage not as comprehensive as Google Scholar. Go to Academia.edu and sign up. Add publications/papers by clicking your name top right, then "add papers"and "import"
One of the steps towards visibility and efficient reference management is a Mendeley account. Mendeley is an Elsevier-owned reference management tool that is used by millions of researchers, offers immediate readership statistics and has strong social functions. Probably many of your publications are already present in the Mendeley database, but with your own account you can make sure that all of them are. And you can do much, much more. Of course, for the reference management function of Mendeley there are many alternatives, such as Zotero, Endnote, RefWorks and more. See the seperate guide on reference management. The Utrecht Unviversity staff profile pages are available since Spring 2013. You can add your CV, profile and list additional functions (free text). It also lists your publications as entered in the University Research Information System Metis. Often this is done for you by the faculty or department administration once every 3, 6 or 12 months. However, one thing you can do yourself is upload the full text of publications to make these more visible. 2) Have a look at your contact information tab. Add links to your other profiles (Linked-In, Google Scholar, ORCID, Academia and others you may have). You can also choose to adds these links to the profile tab.